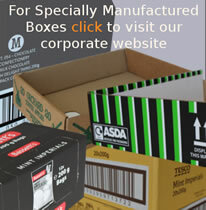 New single wall boxes in pallet quantites shown. Flat packed in bundles and shrink wrapped on pallets. FREE DELIVERY on these items to most UK business addresses. Sizes in inches (approx) and millimeters (internal L x W x H).